Parents bear some responsibility in making sure their children are ready to tackle the new school year. 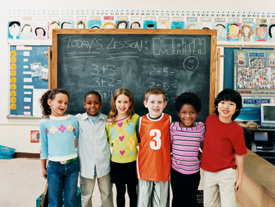 Improving your child’s performance in school is as easy as following these five simple steps. One of the biggest mistakes we make as parents is not ensuring our child gets enough rest. Children (and adults!) need to get plenty of rest in order to focus on their work. Children sometimes need guidance in making healthy food choices and eating a well balanced, nutritious diet. One of the best things you can do is to see that your child starts the day with a healthy breakfast, which includes protein. Keep hunger pangs at bay and give your child a boost of energy to start the day off right. We all need exercise, but children especially need to burn off excess energy! Ideally, children will get an hour of play every day, but no less than three to four days per week. Children should feel good about their school. School is the place where they learn about their world, and that’s a great thing! Parents can help by maintaining a positive attitude about their own school experiences when talking with their children. Regular chiropractic care (about one visit per month) will keep your child feeling healthy, energized and prepared to tackle the rigors of back to school. If you have any questions about how to help your child get a successful start to the school year, please don’t hesitate to ask. Give us a call at (905) 934-7776 – we’re happy to help!